MarkDaniels.Blogspot.com: Gloria Copeland, put a lid on it! 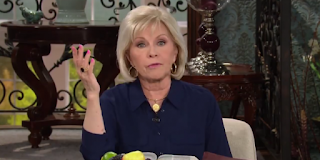 In late January, it was Gloria Copeland’s husband Kenneth defending his private jet and materialistic lifestyle based on his heretical prosperity gospel. This week she spouts nonsense about flu shots. She says that instead of getting flu shots, believers should inoculate themselves with the Word of God. God's Word calls me to faith in Christ and into life in God's kingdom. It does not call me into a superstition that ignores the advances in medicine God allows diligent researchers to uncover. "...he will command his angels concerning you to guard you in all your ways; they will lift you up in their hands, so that you will not strike your foot against a stone." Jesus said that it was wrong to test God. In other words, God’s promises aren’t a license to do stupid stuff or to try His patience. God guides the medical profession in finding cures and treatments. While this year's flu virus is not of the same strain as researchers had anticipated for this flu season, it still can be helpful and will remain in our bodies for future flu seasons when a different strain returns. You wouldn't drive without fastening your seat belt. You wouldn't play football without a helmet. You wouldn't drive at 90 on a mountainous hairpin curve with a posted speed limit of 10. Don't expect God to clean up your messes when you make dumb decisions. Testing God isn't proof of faith, but of a religious superstition inconsistent with Christian faith. Please, if you haven’t gotten a flu shot, do so. And, Gloria and Kenneth, please shut up. Enroll in a good Bible study program where you might pick up on the truth. You harm the Church's witness for the God we know in Jesus Christ every time you open your mouths.